Hy-Tape Offers a Perfect Combination of Safety & Security For Securing a Nasal Cannula. Chronic lung disease often requires months or years of supplemental oxygen. In order to provide your newborn, toddler, or child with oxygen it may require a nasal cannula. Nasal cannulas are thin, plastic tubes used to deliver oxygen to the body through the nostrils. Keeping nasal cannulas and necessary tubing secured is essential to delivering the correct levels of oxygen. The challenges of keeping devices like these in place are difficult. Often times tape can be cumbersome, lead to irritation, or not adhere well in moist environments. In severe cases, tape burns and skin tears may occur when adhesives become overly aggressive or use chemicals that cause adverse reactions. Hy-Tape is proud to have been endorsed by neonatal nurses and caregivers around the globe and by groups such as the Children’s Interstitial Lung Disease Foundation (chILD). Our gentle and waterproof tape is perfect for helping young ones stay comfortable by keeping the nasal cannula properly placed. Our tape is thin and conforming which makes it less cumbersome than most, but what separates us from the rest is the gentle nature of the adhesive. Hy-Tape is called upon in the most difficult situations, such as times where repeat applications are needed, when water and secretions are present, and when skin is thin or easily irritated. That is when Hy-Tape excels. We often recommend our .25″ rolls of tape as they often do not need to be trimmed in width, but there are times when a .5″ roll is more convenient. Our tape is sold in packs of three and in tubes. 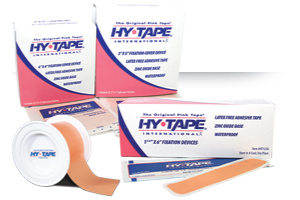 We always recommend trying a sample of Hy-Tape before making a purchase if you are not familiar with the product. Simply fill out the form below. If you have any questions or concerns, please call 1-800-248-0101 to speak to us.